"of Bruce Springsteen's legendary "E Street Band"
Joined BRUCE SPRINGSTEEN'S E STREET BAND as guitarist in May of 1984. NILS HAS Played over 150 shows worldwide on the BORN IN THE USA Tour. HAS Recorded the "TUNNEL OF LOVE" album, released in 1988. Played on the "TUNNEL OF LOVE" and "AMNESTY INTERNATIONAL" world tours with BRUCE SPRINGSTEEN during 1988. 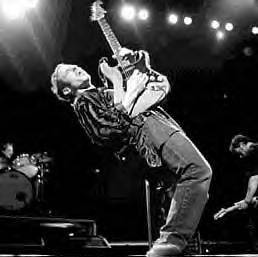 Recorded the "BRUCE SPRINGSTEEN LIVE" album and appeared in numerous Springsteen videos. 2006 - latest solo release "SACRED WEAPON" featuring Kevin McCormick on bass and Timm Biery on drums. Also, duets and vocal performances by Willie Nelson, Graham Nash, David Crosby, Martin Sexton. Margo Reed, Mary Ann Redmond, Tom Lepson, Bob Berberich and the Lofgren Brothers. DVD Release "NILS LOFGREN & FRIENDS LIVE ACOUSTIC" recorded at the Birchmere in Alexandria, VA with special guest appearances by the Lofgren Bros., Mary Ann Redmond, Bob Berberich, Jeff "Skunk" Baxter, Paul Bell & Buck Brown. Session player on JERRY LEE LEWIS release "Last Man Standing", pedal steel on "Sweet 16", released as CD and DVD. 2007 - collaborated with well-known author Clive Cussler on the tune "Whatever Happened to Muscatel" which is available through the website. Recorded with Patti Scialfa on her release "PLAY IT AS IT LAYS". Toured with Bruce Springsteen and the E Street Band in support of the release "MAGIC". 2008 - latest solo release "THE LONER-NILS SINGS NEIL" featuring Nils singing acoustic versions of some of Neil Young's songs. 2009 - release of Bruce Springsteen and the E Street Band's "WORKING ON A DREAM" and world tour in support throughout the year.